After reading the first book, I couldn't wait to jump right into this one. It picks up right where the first book ends. It reads fine as a standalone, but you won't want it to be that way. Definitely start with The Raven Boys and move onto this one. As you're reading the second book, snippets from the first one will pop into your head and all of a sudden you'll feel an added burst of knowledge and insight. It's actually quite brilliantly created. I was really impressed with Maggie's writing style with my first reading of Raven Boys, but I have to tell you I've seen definite improvements in the second book. She has the same flawless storytelling, but this time she's added this daring little prose to it in parts. She's figured out a way to make you realized that things are a certain way, without telling you they are. It's sort of like when two people are thinking the same thing at the same time, only those people have no way of knowing they are. Well, Maggie has incorporated this wonderful new system that lets us know that two people are thinking the same thing by writing them the same way, rather than giving us needless drivel to explain it. The best part of this is that it's random. It's like you're driving along when suddenly a light bulb turns on above your head. Not only that, Maggie has incorporated my all time favorite word, bildungsroman, into her story this time. It's the first time I've seen a writer use it and I had to stop and do a little excited dance in the kitchen. Maggie has forever earned my favor with her vocabulary use. If you were captivated by the first book, then you already know you need to pick this one up. 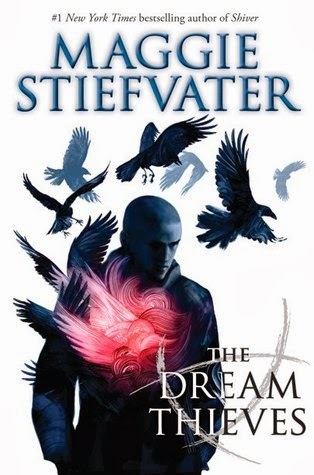 Stiefvater is a master at the ending cliffhanger and I'm sitting here wanting to send her nagging e-mail to make sure she's nearly finished with the third book in the series. We take a fascinating and magical book to all new levels this time. Dream Thieves builds upon the basics we're taught in the first book, but we're taken to a completely new height in magic fiction here. Not only that, you really won't want to miss the thrills in this one. An author at the top of her game. That's Maggie Stiefvater. If you loved the first installment, you will not be disappointed. Of course, if you read The Raven Boys you already knew Maggie's work wouldn't disappoint.